The fast and diverse build pace needs a system that lets the team know what just happened and what’s happening next. With each unit at a different stage of completion, we help you keep the trades and their activities flowing smoothly. Unique. Complex. Variable. Manage all communications, documents, variations simply and efficiently. We help you manage the sale, the contracts, the build, the commissioning and importantly the referrals for the next job. Big and bold and beautiful but only delivered smoothly with a system that manages from design to production to installation. 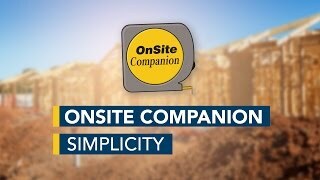 OnSite Companion manages your initial interaction with your clients. This allows you to collect vital information about the client and pass it along as the job progresses. During preconstruction, OnSite Companion will ensure the job is progressing, allowing communication to staff, clients, councils, estimating and drafting. Your supervisors will have full access to all job schedules, trades and supplier information and documents and messages whilst out on site. As your job cycle comes to a close, you will have a full record of all communications, completion dates as well as defect logs and checklist items. Once your job is complete, it can be moved into the warranty phase, which automatically archives all job notes, completion dates, photos and documents for later use. Provides the ability to create custom reports from any data within the system pertaining to jobs, clients, people or tasks. Highly flexible in the way it publishes information from the system. The reports can be saved and shared with different members of the team and is ideal for business review purposes by management on an ad-hoc or schedule basis. Contact us for more details on this powerful option. This feature allows selected data from OnSite Companion to be published to a client facing interface application such as a custom designed website or an app. This allows for automatic content management on our clients website to provide up to date documents, activity flow, notes and communications in a way that is personalised to our individual client’s needs. For example when specific tasks are completed in the job’s workflow, data is then pushed through to the Client Portal which can then generate a message to be sent to the client. Contact us for ideas on how this add-on will deliver better client relaionships for your business and reduce the burden on your service team. This gateway is a sophisticated add-on that provides two way data interchange between OnSite Companion and Databuild so purchase orders get dates from OnSite Companion, Service provider invoices can be visible and authorised in OnSite Companion. For example, trade invoices can be checked against the works being done in OnSite Companion and then approved for processing in Databuild’s accounting ledger without the need for emailing or posting paperwork. Likewise, a purchase order can be issued to a supplier from a Databuild estimate and then sent with a work release by the user of OnSite Companion, with the ability to review the order detail as needs and so much more. Contact us for details on the effeciencies this option brings to Databuild. The construction industry generates a lot of documents so we developed an add-on feature to automatically import documents such as purchase orders, plans etc. to be seamlessly imported into OnSite Companion to give the users visibility to the documents. When imported, the documents are managed by the integrated Document Manager feature in OnSite Companion giving access to the documents online or offline, in the office or on the project site. Contact us to discuss the systems you may have now and how this feature can integrate with them. Companion Systems development team can work with you to develop custom gateway solutions for data interchange between OnSite Companion and sophisticated ERP Solutions. Linking specific tasks completion alerts to action progress payment claims can have a very positive impact to cashflow in businesses that are busy with lots of work or growing as fast as they can. Contact us for ideas on how we can develop this add-on to deliver benefits your business can really bank. For more information about our Add-ons or to request an add-on for your business contact us. We will get back to you as soon as possible. Want to know more? Request a Demonstration here. 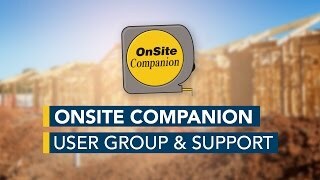 Complete the form below to arrange a demonstration of OnSite Companion to see what it can do for your business. Demonstrations are available worldwide using our online meeting facilities. One of our consultants will contact shortly to confirm your appointment.